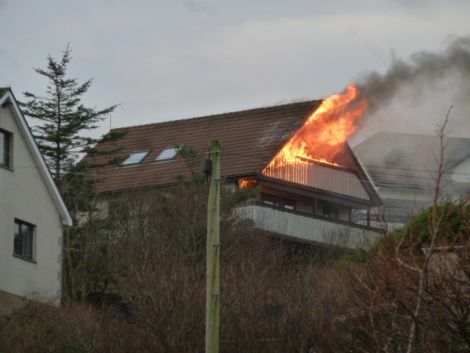 A HOUSE fire broke out in a residential street in the south of Lerwick on Monday morning. 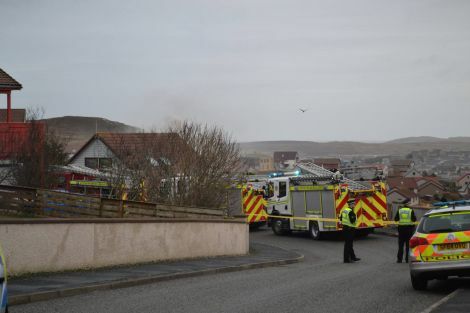 The Scottish Fire and Rescue Service said that a total of six fire appliances were in attendance at what was described as a “significant fire” at Sandyloch Drive. Four police cars were also on the scene and the road was closed off. No one was home at the time. A fire and rescue spokeswoman said the callout came at 10.01am and firefighters were on the scene by 10.12am. The fire was on the first floor and roof area of the two-storey home, and six sets of breathing apparatus and four hose-reel jets were used. The fire had been brought under control by 12.30pm. As of lunchtime four of the fire appliances had departed but two Lerwick fire engines remained on the scene. It is understood that the occupants had only recently moved into the property.